Nothing pains a parent more than seeing their kid in pain and not being able to take their place or ease the pain. 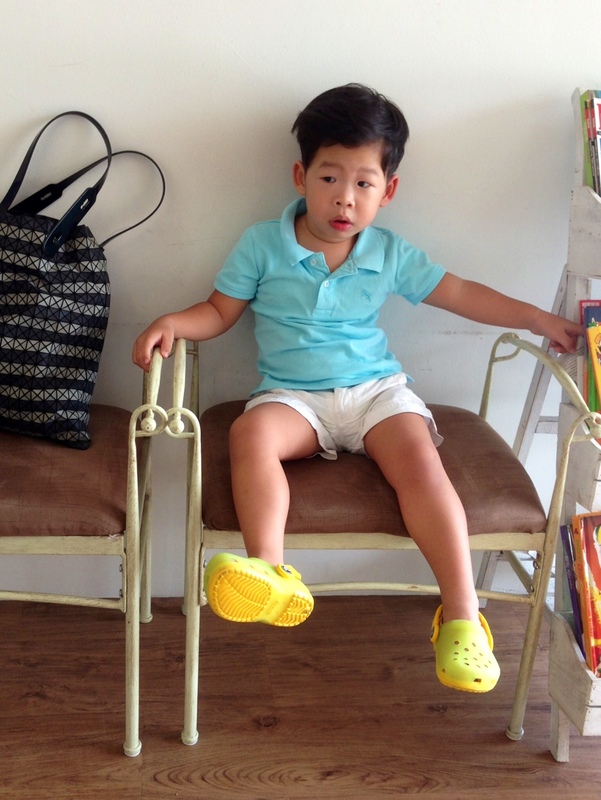 An unfortunate accident in school last Monday resulted in Aiden having to go under general anesthesia for his root canal treatment at 29 months old. On the way home with Daddy Darren after my gynae visit, my mum sent me some pictures of Aiden. As soon as I saw the pictures, I noticed something amiss. His tooth looked different, and from the blurry picture, it looked like a sharp vampire tooth. I was pretty upset (my first thought was how he didn't look good without perfect teeth now!) and was anxious to find out what happened. As soon as we spoke, it seemed that Aiden had a fall in school earlier in the day and cut his lips. His tooth may have chipped during the accident. We rushed to the school so we could find out more but it was closed when we reached, so we drove to see Aiden. I felt so angry as we were not informed of his fall - how irresponsible was that. Aiden didn't show signs of pain when we saw him. He told us how he ran and fell down in school earlier today. Visibly, the wound on his lower lip was still fresh and he was still bleeding slightly. The next morning, I went to see his principal and the teacher in charge when the accident happened. First of all, the principal was not informed of this accident and Aiden's fall. The teacher explained to me how the floor was wet from spilled water and Aiden ran, slipped and fell when she turned to get a cloth to clean up the spill. I was mad, how negligent was that? How do they expect a class of two year olds to understand the danger of running on wet surfaces? When questioned on why she did not call to inform myself or Daddy Darren, she said that she had told my dad of the incident when he fetched Aiden and had him sign an incident report (which wasn't an accurate account anyway). The incident report also mentioned 'Informed parent', which she conveniently asked my dad to sign. I was shocked and made it clear to the principal that the school should call and inform us when there is such a fall. They did not check closely to notice a chip in his front tooth either. And they got my dad to sign on the inaccurate incident report. The next few days were spent going to dentists, consultations and arranging to do the recommended procedure - root canal treatment soonest possible to minimize the pain of the exposed nerve in his tooth. 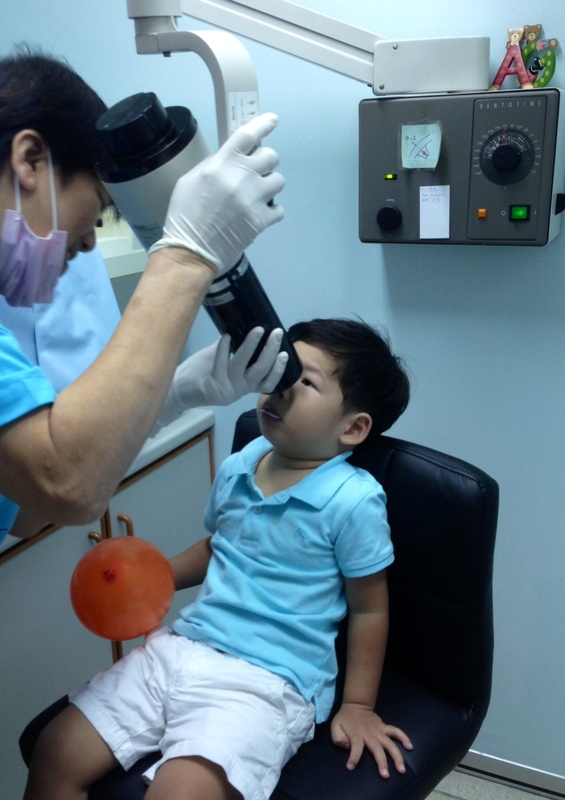 The brave boy followed me as we went to the different clinics and hospital, and did not make a fuss when he had to see the dentist for the first time. In fact, we went to 3 consultations to ensure that the recommended treatment was the best solution, that he has to undergo GA, and to arrange for the soonest possible date for the procedure. Finally we managed to arrange for the procedure to take place last Thursday morning at Gleneagles. 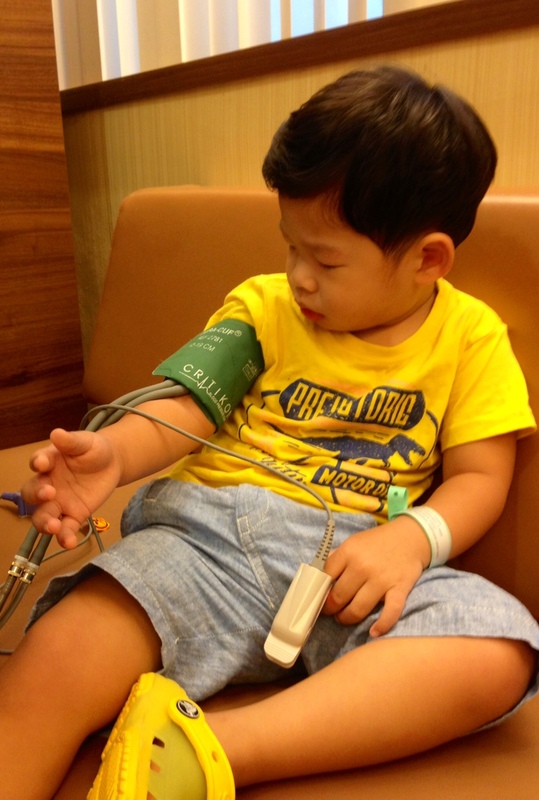 The boy had to go through a few routine checks before his operation, and he felt discomfort even with us around. It was time to get him dressed for the op, and it took some coaxing to get him to change into this. I had to put on a really brave front so Aiden would also feel confident and assured. 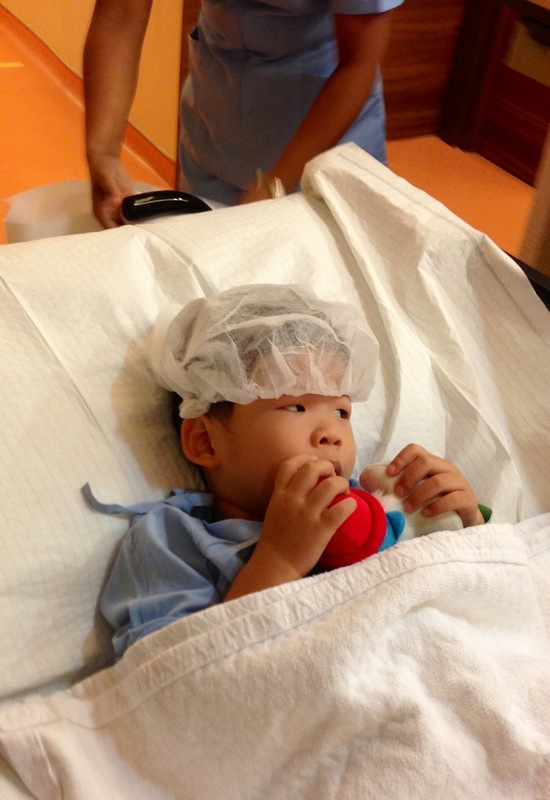 Seeing him lay on the oversized bed and pushed towards the operating theatre, I felt a tinge of sadness. He was quiet for awhile, and I knew he was worried and a little scared. As more nurses, doctors came to see him, he was also getting more cranky and wanted to hold me and be close. I accompanied him into the operating theatre where they applied GA and it was a struggle I really couldn't bear see as they made him breathe into the mask. I had to leave when they started the procedure and under an hour, they called us back. It was so heartbreaking to see my boy feeling lost, wailing loudly and inconsolably when I saw him after his operation. He wanted to get out of bed even when he was still feeling groggy. I carried him close to me as soon as they removed the drip from his hand. I could see him in pain as he cried and pointed to his teeth and hand saying, 'Pain, mummy pain'. This lasted almost an hour and he calmed down when we returned to his ward. I felt so helpless then. Though I know that holding him close in my arms would comfort him, it couldn't ease the pain he was going through. Throughout this, the school contacted me to be updated on his condition. I felt that they were slightly threatened that we would make a big fuss and complained or even sue them after the recent child abuse incident at My First Skool. It really was an oversight on their part that led to this unfortunate incident. We hope this incident would serve as a reminder to them to ensure safety in the environment where kids as young as 18 months old roam freely. This could happen to any other kid, and it could have been worse than a broken tooth. 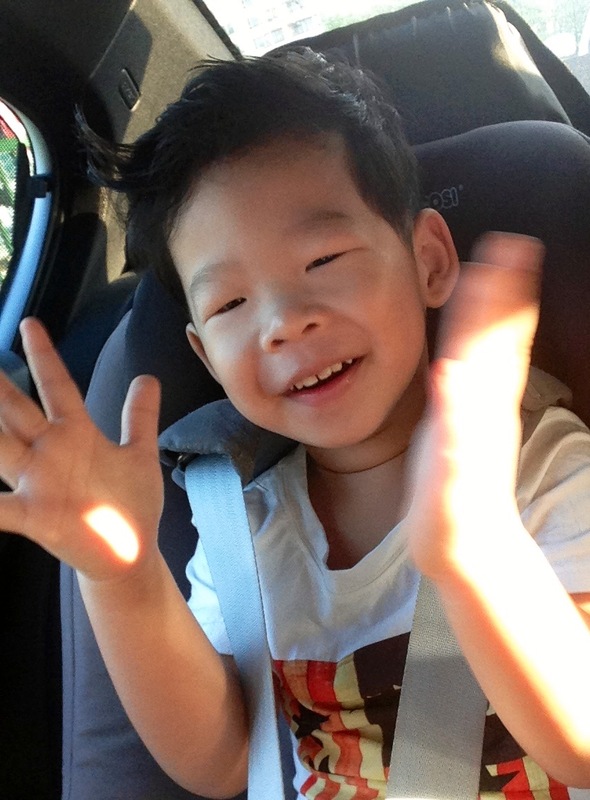 I am happy to see Aiden bounce back to his self after the procedure. It also reminded me how resilient and strong kids are, though it pains me to have to see him go through this at a young age. Hopefully he doesn't remember this in time to come and be the happy boy he has always been. oh dear! 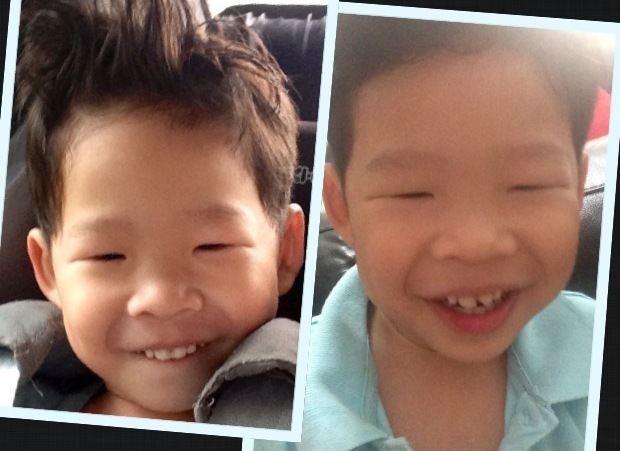 Which sch is aiden studying at? my gal is attending pre nursery next yr n I'm getting the jitters each time I reach such reports. 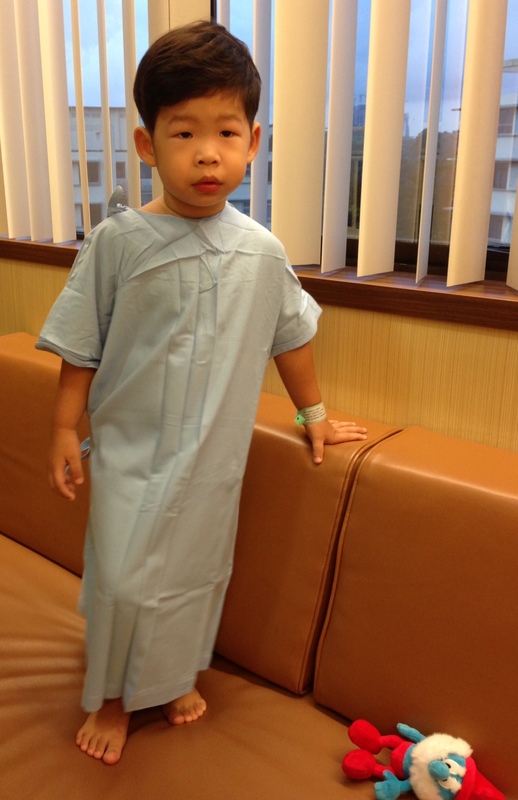 I can imagine how angry u r w the sch n how painful ot is for a lil boy to go thru rct. I had one myself at the beginning of the year n I freaked out let alone a lil innocent boy! Yes it was really unfortunate. I've never had a root canal treatment and can only imagine the pain he has to go through. It was heartbreaking seeing him cry in pain when he came out of it. oh no, I hope he is feeling better soon! He is a brave boy to go through all this! My nephew just had both front teeth removed because of a bad fall too, but that was totally his own mistake when playing outside. I agree the school should have informed you of the details and the inaccurate report sounds like a joke and a way to shrink from all responsibilities.